Happy Monday! I’m especially happy for today as I’m waking up in sunny California! I did make it down here Friday for Expo but only lasted 5 hours before my body was done since I was just starting to recover from being sick all last week and I wasn’t even sure until the next before my flight if I was even going to still try to go. I went back to rest and planned on going back Saturday as I had appointments made but my body wasn’t on the same page and I pinched my nerve and had sciatic pain so bad I had to go in and I’m still not 100% but I’m finding the positive in every day and trying to make the best of it. I headed up the coast with my sweet hubby (who had a bad cold and fever when I got down here but is doing much better) and we are spending a week in Yountville for our anniversary, and my birthday is this week! So much going on I need my super powered superfoods these past couple weeks, and in the coming weeks, even more than ever! Ok so really superfoods don’t have super powers and aren’t going to magically fix anything but they keep this busy mama going strong and running my best. Usually! Honestly I havent’ been to the doctor due to illness in 9 years so even though I did get sick last week I have heard it’s hitting people hard and they told me 1-2 weeks for recovery and I was on my plane in less than a week. 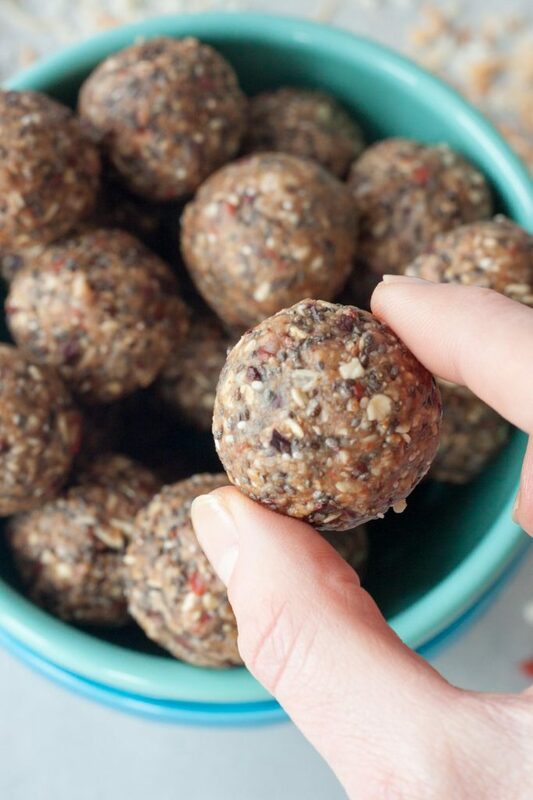 These Super Power Superfood Bites are packed with so much goodness for weeks I couldn’t figure out a good enough name for them. 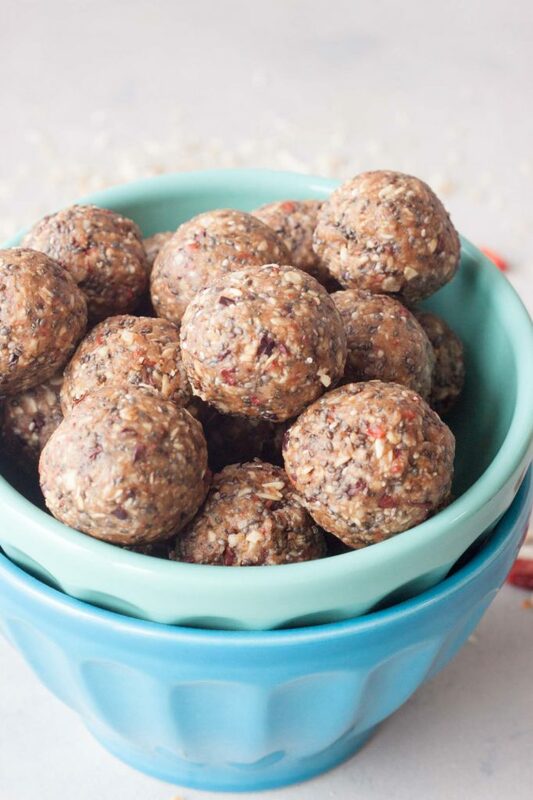 My husband wanted Seed and Berry Superfood Bites but they are so much more, 10 of my favorite ingredients! Yes I can count and I know there are really 11 listed but 10 if you don’t count the cinnamon or leave out the optional goji berries it’s 10 and this is how I love them. I ate so many of these thinking a name would just pop in my head as quick as I was popping them in my mount but nope so I went with Super Power Superfood Bites. 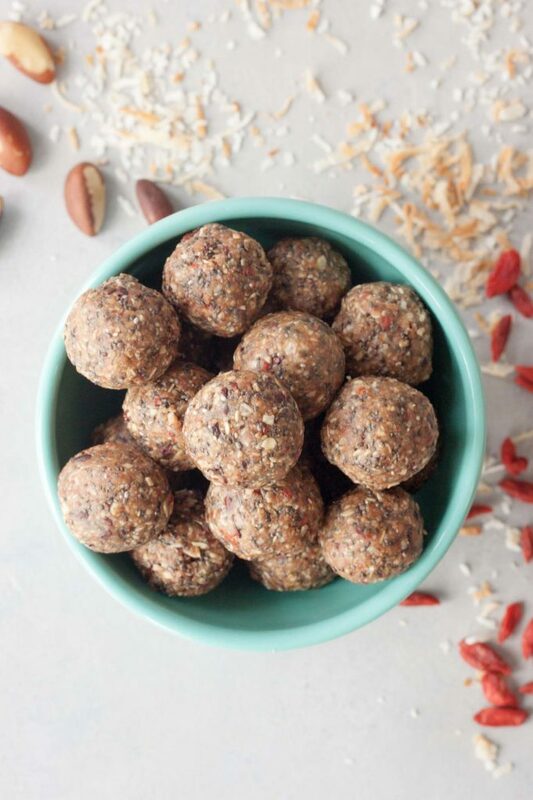 So many goodies and so much nutrition packed in these Super Power Superfood Bites I don’t even know where to start! I start with oats for a nice base, they add in filling fiber and carbs. Oats are also great for lowering bad cholesterol and are heart healthy. Brazil nuts contain magnesium which helps with the functioning of muscles, the production of protein and absorption of energy from food. They are also said to promote thyroid function as well as support bone and teeth health. Chia Seeds are loaded with omega fats, protein, antioxidants and fiber. They are a great source of healthy essential fatty acids, eight times more than salmon! They’re also one of the most digestible plant proteins. Coconut is packed with fiber and healthy fats that help keep you full. Coconut oil and coconut is well known for medium chain triglycerides (MCT) – healthy fats that are burned quickly by the body for energy and are not stored as fat. Not a nutritional benefit but using coconut also really boosts the flavor! More healthy fats, a little protein, and nutrition with almond butter. You can sub cashew butter as well but nutritionally in these bars I like to use almond butter. Trying to stick to a raw homemade almond butter, or making your own, that is just almonds and made without added sugar. For sweetener and to help these sweet little bites stick together you can use your choice of liquid sweetener such as maple syrup, honey, or agave. Making sure to use pure maple syrup if using it, will add some trace minerals. Honey I like local honey. Controversial agave is a option watching their blood sugar levels with it’s low glycemic index. Cinnamon for a little flavor and it’s known to stabilize blood sugar. Maca, which I love and have mentioned many times has been a staple for so many years first for fertility reasons. More recently for balancing hormones, it’s adaptogenic like qualities that help my body deal with stress, and enhance stamina and energy. I personally like to use Gelatinized Maca. Goji berries are packed with 18 amino acids, free-radical fighting antioxidants, carotenoids, vitamins A, C, and E, and more than 20 other trace minerals and vitamins including zinc, iron, phosphorus and riboflavin. They are even a complete protein and 1 ounce contains 4 grams of protein. Fun fact, ounce-for-ounce, goji berries contain more vitamin C than oranges, more beta-carotene than carrots, and more iron than soybeans and spinach. Wow those are some pretty sweet powerful berries! For centuries they have been said to help with greater health, vitality, longevity, energy, and stamina. Lastly Cacao nibs, which are also known as “nature’s chocolate chips!” They are made from peeled cacao beans. They are not sweet like chocolate chips, if you are wanting something a little sweeter you can add in sweet cacao nibs which still aren’t as sweet as chocolate chips but nutritionally aren’t the same either. Cacao nibs are loaded with antioxidants, actually one of the most antioxidant rich foods on the planet, which is maybe why they are also called “food of the Gods”. Cacao nibs also contain fiber and a number of minerals such as magnesium and iron. There is more to all of the super foods packed into these Super Power Superfood Bites if you want to do the research but really they are not only healthy they are a delicious bites that are packed with so much flavor and texture that not only satisfies me but leaves me feeling good. While everything in moderation I have no guilt grabbing these out of the fridge. Last week I think I was grabbing 4-5 throughout the day with everything going on. I even grabbed the last few I had to enjoy on the plane to Expo and was debating on bringing some with to balance out the wine and good eats on the trip but I decided they would be something I’d be looking forward to having when I got back home and back to a more healthy balanced life. I’m all about living a healthy, HAPPY, balanced life. 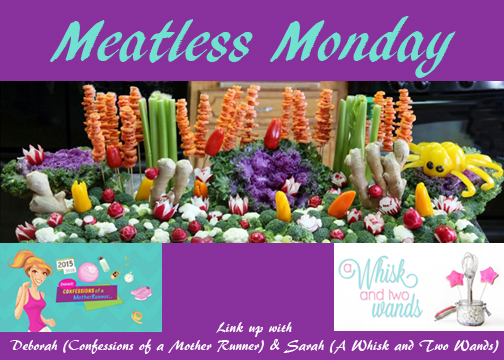 Even though I’m traveling I still look forward to seeing all the Meatless Monday creations linked up below and know my co-host Deborah will be holding down the fort this week. I will be checking in periodically and catching up on comments and everything when I get back next week. Hope you all have a healthy HAPPY week! If toasting up your coconut preheat your oven to 350F. Spread coconut out on a rimmed baking sheet and place in the oven watching closely and mixing once after a couple minutes. It will only take a few minutes to brown so watch closely. Let cool for 5 minutes before blending into your bites. Pulse Brazil nuts, add oats, chia seeds, maca, cinnamon and pulse until well chopped course flour texture. Pulse in coconut, goji, and cacao nibs. In a bowl mix together nut butter, maple syrup/honey, and coconut oil until smooth. Pour the nut butter mixture into your food processor and blend until mixture comes together, scraping down the sides as needed. Form and roll into balls and place in the refrigerator for 30 minutes to set. Store in an airtight container in the refrigerator, or freezer for longer storage, until ready to enjoy. If enjoying from the freezer let thaw a little first, I enjoy them straight from the refrigerator. Make a version with no goji berries or cinnamon, up coconut, maybe coconut flour and no oats, and acai powder. You can also add any of the superfood powders you can find at purepathessentialoils.com, instead of just maca powder. 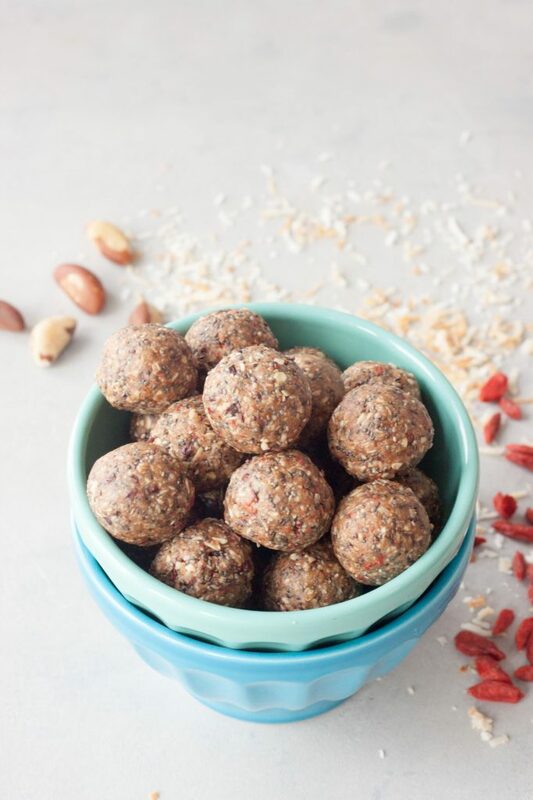 Healthy superfood packed bites that will fuel your body and are packed with whole food nutrition. Welcome to California! Even though I’ve lived here all my life I have no idea where Yountville is! I hope you feel better and hav a great anniversary and birthday celebration! Oooh love the Brazil Nuts and the goji berries in there! These are full of goodness! These look amazing- I have never used maca powder- I will have to hunt it down! Oh and these bites… YUMMMMM!!!!!! I’m glad you were able to make it to the Expo, even if you had to take it easy! These energy bites are awesome! I love all the super-powered ingredients…especially the goji berries!! Love everything about these powerhouse bites! Perfect for breakfast, snack, heck, even dessert! Love! Hope you’re finally feeling better! Love the name you chose for these bites! They look delicious! I made some type of new “ball” every week and keep them in my freezer for a grab and go snack. I am always looking for new combinations! These little guys are amazing. So much power in a small little bite. I will put these on my must try list! Goji berries are one of my favorite superfoods, I can’t wait to try this recipe! Hope you’re feeling better! These bites I something I must try on for a nice breakfast treat, Sarah! I loved the recipe!